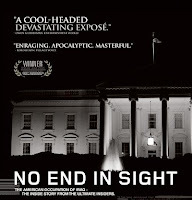 Dave Splash Dot Com: A Quick Review of "No End in Sight"
A Quick Review of "No End in Sight"
Saw an excellent documentary over the weekend called No End in Sight. The film details the myriad of mistakes made by the Bush Administration in its occupation of Iraq. It's from 2007, so chances are, you might have already seen it. If you haven't, be forewarned, it will make you hate George W. Bush and Donald Rumsfeld all over again. The rage I felt toward Rumsfeld especially, after seeing it, was severe. He should have been put on trial for criminal negligence. The arrogance and incompetence of that man is at a level I have never seen before or since. A lot of the information presented in the film I already knew, but there were some things that really stood out. For example, it was revealed that no planning for post-war Iraq was made until 30 days before the invasion. Thirty days! In WWII, there was a plan for post-war Germany made two years in advance. The State Department was completely shut out of nearly every process; and in one instance, those who were supposed to be in charge of re-establishing Iraq's government ministries after the invasion were put in an empty building without phones, computers, or even paper. This was no accident, either. Rumsfeld wanted to make every decision personally, so he intentionally marginalized every career service officer. Many of them recalled being replaced by recent college grads with no experience. They landed the jobs because their parents were big donors to the Bush campaign. 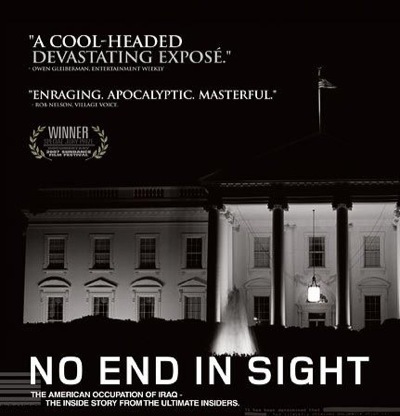 After seeing this film (which is packed with interviews with many of the main players except for Bush, Cheney, Rice, Wolfowitz, and Rumsfeld who all refused to be interviewed) I know that it was Bush's cabinet - not the military or the State Dept - that was responsible for the disaster that was our first few years in Iraq. In example after example, the film demonstrates how Donald Rumsfeld himself personally intervened in nearly every disastrous decision that was made (too few troops, disbanding the Iraqi Army, de-baathification, not stopping looting, etc). Every bad decision could be traced back to Rumsfeld. He is, without a doubt, the least competent Defense Secretary in US history. Without a doubt. Hell, he and L. Paul Bremmer practically started the insurgency with their idiotic decision to make 500,000 trained and armed men (aka the Iraqi Army) unemployed and permanently un-employable in the future. The army leadership made it very clear to US authorities that they were not loyal to Saddam Hussein, but to the nation of Iraq. Imagine how different the war would have been if Rumsfeld had actually listened to the people on the ground instead of substituting his ideology for their first-hand accounts of the situation. Check out No End in Sight, but only if you have a strong enough constitution to withstand seeing that vile Donald Rumsfeld on your TV again. I had a tough time. Rumsfeld and Bush did indeed make many mistakes, particularly in the aftermath of the Iraq war. Thankfully Bush did fire Rumsfeld and listened to the excellent advice of General Petraeus in the long run. Things would have gone far better had he listened to his generals on the ground to begin with. As for Bremer, he was an unmitigated disaster too.